How to build a bacterial cell wall? Antibiotics used to treat infections caused by Gram-positive pathogens are typically ineffective against Gram-negative bacteria (figure 1 top panel). This is caused by the thick Gram-negative cell wall that is made up of different layers, namely: the outer membrane (OM) and peptidoglycan (figure 1 bottom panel). The latter resides in the aqueous periplasm and is composed of cross-linked peptidoglycan monomers (1). The OM is exposed to the extracellular environment and comprises an asymmetric lipid bilayer that contains phopsholipds in the inner leaflet and glycolipids in the outer leaflet. Lipopolysaccharide (LPS) is the principal glycolipid of the OM and is a complex, amphipatic molecule. Structurally, LPS comprises a conserved lipid A moiety with six or seven fatty acyl chains that is linked to a polysaccharide core and an extended polysaccharide chain (O-polysaccharide) that contains up to 200 sugar moieties (figure 1 bottom panel) (2). Some of these sugars contain phosphate groups that interact with Mg2+. This enables LPS molecules to associate and form a tightly packed structure. Conceivably, the hydrophilicity of the sugar moieties and the charged phosphate groups restrict the entry of small hydrophobic compound. Thus, LPS is crucial for establishing the permeability barrier of the OM, thereby preventing the entry of noxious agents from the environment. It is therefore not surprising that in most Gram-negatives LPS is essential for viability (1). The biosynthesis of LPS is reasonably well understood and requires over 100 genes. LPS is synthesized in the cytoplasm with the lipid A-core oligosaccharide and O-polysaccharide on the cytoplasmic side of the inner membrane (IM). Subsequently, the lipid A-core oligosaccharide complex is flipped to the periplasmic leaflet of the IM by the ABC transporter MsbA, while the O-polysaccharide is synthesized independently from the rest of the LPS molecule in a stepwise fashion on a lipid carrier molecule. This also directs towards the periplasmic side of the IM by its lipid carrier. Next, the O-polysaccharide is ligated onto the LPS core by the O-antigen ligase WaaL (2). The sorting steps of LPS towards the OM are less well understood. It has been shown that LPS transport from the outer leaflet of the IM to the outer leaflet of the OM requires seven essential proteins known as Lpt (lipopolysaccharide transport) BFGCADE (3,4). LptB represents the ATPase domain of an ABC transporter that is involved in the transport of LPS, while LptF and G are the membrane-embedded subunits of this complex. LptB, F and G, therefore, associate to form an ABC transporter in the IM that interacts with LptC, another membrane protein, to extract LPS from the outer leaflet of the IM (3). Following extraction, LPS is handed over to LptC and subsequently transferred to the periplasmic protein LptA. LPS is transported next to the LptDE complex located in the OM that facilitates its insertion and assembly into the outer leaflet of the OM (4). Importantly, the LPS sorting and assembly pathway, and in particular the Lpt proteins, represent a promising target for the development of novel antibiotics. Identification of new drug targets is of key importance considering the growing amount of antibiotic-resistant Gram-negative pathogens. A detailed molecular understanding of how the Lpt proteins facilitate LPS transport is therefore crucial to design drugs that interfere with this pathway. High resolution structures of LptDE have contributed to increasing the understanding of LPS insertion and assembly (5) but LPS transport across the periplasm is at present not well understood. It is, therefore, important to note the recently detailed structures of the membrane-embedded complex responsible for LPS extraction and subsequent transfer to LptA have been reported (6). Here, I will discuss these structures as well as the current understanding of LPS transport across the periplasm. It has been suggested that during each cell cycle 1-3 million molecules of LPS are assembled on the bacterial cell surface with an estimated speed of 70000 molecules per minute. The transport of complex LPS molecules to the cell surface poses several logistical challenges because they have to travel unidirectionally across all compartments of the Gram-negative cell envelope – IM, periplasm and OM. Transport of LPS from the IM to the OM can potentially occur through three biologically established mechanisms, namely: vesicular transport, diffusion at sites of contact between the IM and OM or protein-mediated transport (9). Vesicular transport was, however, never observed in the periplasm of Gram-negatives using electron microscopy, while points of contact between the IM and OM were reported by Bayer in E. coli cells, ranging from 200 to 400 in an individual cell (7). These fusion sites were named Bayer bridges and although it is not clear if these structures are physiologically relevant, evidence has been presented that in Salmonella typhimurium transport occurs at or near Bayer bridges (8). The role of Lpt proteins in the sorting and assembly of LPS has been well established, although it is not known if this indeed involves or takes place at Bayer bridges. The Lpt proteins are distributed over three distinct compartments of the Gram-negative cell envelope (figure 2). LptB, F and C are located in the IM and probably form an ABC transporter complex that is probably responsible for the extraction of LPS from the IM at expense of ATP. It is thought that LptB comprises the nucleotide binding domain that binds and hydrolyzes ATP, while LptF and G serve as transmembrane components that are probably form a cavity to accommodates LPS during its extraction from the IM. LptA is localized to the periplasm, while LptD and E reside in the OM, forming a complex that is facilitates the assembly of LPS into the outer leaflet of the OM. Depletion of any of the Lpt proteins blocks LPS transport to the OM, resulting in accumulation of LPS in the IM. This points towards a model in which all Lpt proteins are jointly required for the transport of LPS. Figure 2 (obtained from 11) shows two potential models for Lpt-dependent LPS transport. In the chaperone model (left panel), LptA is predicted to bind LPS in the periplasm as a soluble complex and shuttle it between the IM and OM similar to LolA, the chaperone that chaperone that is involved in lipoprotein trafficking across the periplasm. Alternatively, LPS is transported through a protein bridge that spans the cell envelope (right panel) at fusion sites between the IM and OM, thereby also explaining Bayer bridges (9). Over the past years a substantial amount of evidence has been presented that strongly supports the second model – transport of LPS through a membrane-to-membrane protein bridge or trans-envelope complex. The first results that pointed towards a difference between both models were obtained with E. coli spheroplasts (cells with a disrupted OM and peptidoglycan layer that lack a periplasmic content) to which a concentrated periplasmic preparation with LolA was added. This releases lipoproteins from the IM but not LPS, showing that LPS does not form soluble complexes unlike lipoproteins. Moreover, it was found that LPS transport still occurs in spheroplasts in the absence of a periplasm (10). Subsequently, it was shown that all seven Lpt proteins copurify, thereby demonstrating that they physically interact, while these proteins also localize to the same membrane fraction following sucrose gradient centrifugation of lysed E. coli cells. These results provided the first biochemical evidence that Lpt proteins form indeed a trans-envelope complex (11). Insight into the potential architecture of this complex was obtained from structural studies, showing that in the presence of LPS LptA forms long fibers with each LptA molecule organized in a head-to-tail fashion (figure 3 left top panel). Structurally, LptA consists of 16 anti-parallel beta-strands that are aligned back-to-back and are folded into a twisted beta-jellyroll with a central hydrophobic groove that probably shelters the hydrophobic acyl chains of LPS during transport across the periplasm (figure 3 right top panel) (12). 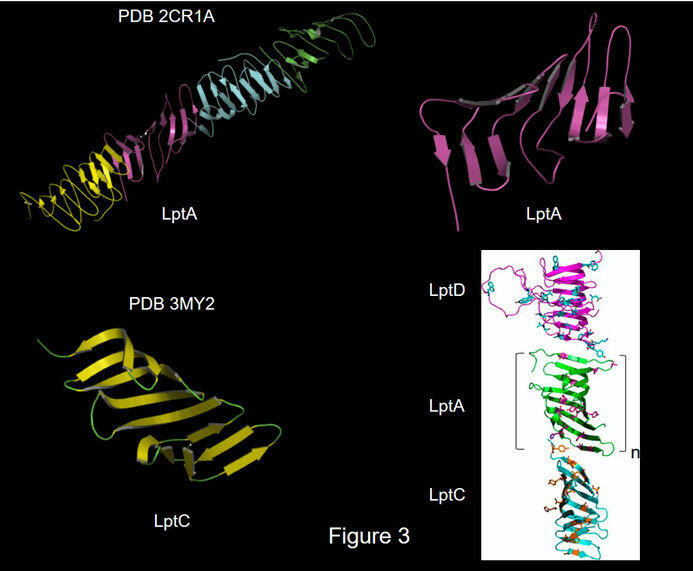 LptC is a single spanning membrane protein with a large periplasmic domain of which the crystal structure was solved (figure 3 right bottom left panel). This revealed that this domain adopts a similar beta-jellyroll conformation as LptA with 15 consecutive, anti-parallel beta-strands (13). Furthermore, a cross-linking approach was used to establish the in vivo molecular composition of the trans-envelope complex through incorporating a photoactivatable amino acid at different positions of E. coli LptA, LptC and LptD (14). This revealed that the N-terminal end of LptA interacts with LptC, while LptC associates with LptA through its C-terminal end. Hence, LptC and LptA interact via the edges of their C and N-terminal ends, thereby explaining how LptA is tethered to the IM. Additionally, it was found that LptA interacts with LptD at the OM via its C-terminal end, whereas the N-terminal end of LptD is required for LptA binding. Based on these findings it was concluded that LptC, LptA and LptD interact through C and N-terminal associations, creating a continuous bridge of antiparallel beta-strands between the IM and OM with a central hydrophobic groove (figure 3 bottom right panel). To unambiguously demonstrate the requirement of all Lpt proteins for LPS transport from the IM to the OM, this membrane to membrane process was recently reconstituted in vitro by incorporating purified transport complexes from the IM and OM into separate proteoliposomes (15). This showed that all Lpt proteins and ATP are necessary and sufficient for LPS transport from the IM to the OM via a protein bridge. Based on the dimensions of the periplasm it was suggested that one or two molecules of LptA together with LptC and LptD would be sufficient to span the periplasm. Despite demonstrating unequivocally that membrane-to-membrane LPS transport requires all Lpt proteins, the question of how this process is powered is still unanswered. It is, however, thought that the LptB2GFC transporter of the IM functions as an ABC transporter that extracts LPS from the IM at the expense of ATP. The energy released by ATP hydrolysis is subsequently harnessed to power LPS transport across the periplasm. However, the molecular details of this are not known and with regards to this it is important to note that recently the structure of the LptB2GFC complex of two Gram-negative bacteria (Vibrio cholerae and Enterobacter cloacae) was presented at 2.82 and 3.20 Å, respectively (6). These structures are shown in figure 4 and comprise a membrane-embedded complex made up of five proteins that are required to extract LPS from the IM and pass to the transenvelope protein bridge. The V. cholerae complex (PDB 6MJP) is displayed in the left panel (ribbon representation) and center panel (surface representation) and reveals an) overall structure with an asymmetric architecture. As expected, two LptB subunits (in gren) are associated with LptF (in yellow) and G (in magenta) that comprise the transmembrane components of the ABC transporter with six transmembrane domains (TMDs) each and a large periplasmic domain, while LptC (in orange) contains one TMD that is connected to a large periplasmic domain. All periplasmic domains are made up of antiparallel beta sheets that folded are folded into a β-jelly roll with the domains of LptF and LptC connected through C and N-terminal ends, creating a continuous β-jelly roll as reported before for LptA fibers. Interestingly, the TMD of LptC (in orange) is sandwiched between TMD1 of LptG and TMD5 of LptF. The importance of this TMD was assessed by analyzing LPS transport in vitro with proteoliposomes reconstituted with LptB2GFC complexes that contain no LptC, wild-type LptC or a variant devoid of its TMD. No LPS transport was observed in the absence of LptC, while the variant without its TMD supported LPS transport. However, an increased ATPase activity was observed upon addition of more of this variant. These findings suggest that the TMD of LptC modulates ATP hydrolysis to increase of the efficiency of ATP hydrolysis coupled LPS movement. Based on the structures of the V. cholera and E. cloacae complexes a pathway for LPS entry and transfer on to the protein bridge was proposed, namely: following extraction from the IM, LPS enters the LptB2GFC complex through a cavity located near the TMD of LptC between TMD1 of LptG and TMD5 of LptF (figure 4, left panel indicated by an asterisks). This pathway aligns with the continuous β-jelly roll formed by the periplasmic domains of LptF and LptC. In vivo crosslinks between LPS and LptF or LptC are consistent with this pathway. Moreover, these in vivo crosslinking results also suggest that entry into the LptB2GFC complex is ATP independent, while movement onto the continuous β-jelly as well extraction of LPS from the IM are ATP dependent. Although the current structures reveal how LPS enters the LptB2GFC complex and is moved onto the protein bridge, the mechanism that prevents backflow of LPS from the bridge is not immediately clear. With respect to this, it is therefore interesting to note that the β-jelly roll of LptF was crystallized in two different states. Specifically, in the structure of the V. cholera complex this β-jelly roll is closed, while it is open in the E. cloacae complex (figure 4, right panel). A structural comparison of both complexes is shown in figure 5 (left panel) with LptB and G omitted for clarity. This reveals two conformations of the loop between the third and fourth β-strand of the periplasmic domain of LptF. A close up of this region is provided in the right panel of figure 5 with the respective loop indicated (yellow in the V. cholera complex and grey in the E. cloacae complex). Based on these structures it was proposed that this loop functions as a gate that prevents the backflow of LPS. To establish the molecular role of this loop, double cysteine mutations were introduced into it and it was found that this LptF variant is lethal when expressed in E. coli cells. Moreover, complexes that contain this LptF mutant do not support LPS transport in vitro unless DTT is added which reduces the disulfide bond, thereby allowing LptF to open. Thus, the loop between the third and fourth β-strand of the periplasmic domain of LptF plays a critical gating role in LPS transport by controlling access onto the protein bridge. 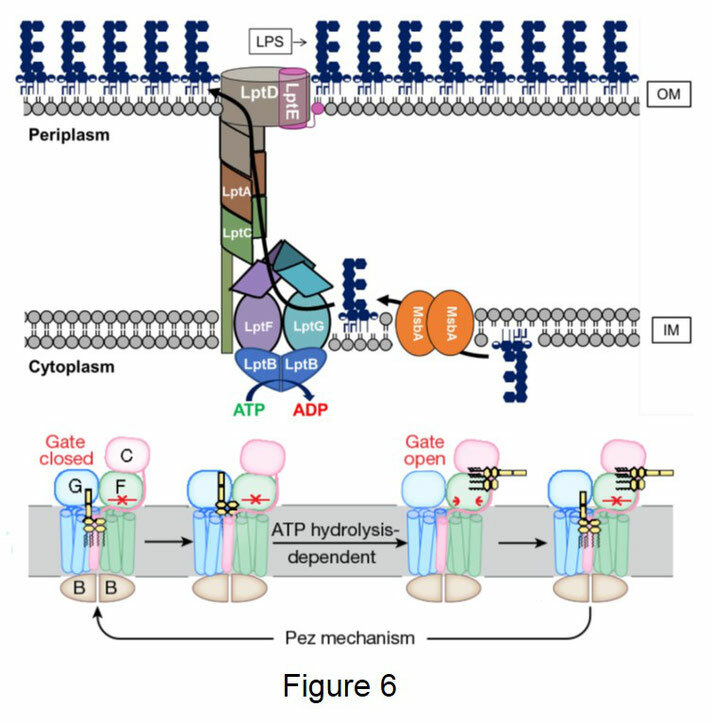 Conceivably, movement of LPS, driven by ATP hydrolysis, pushes the gate open. Closure of the gate behind LPS provides a mechanism that prevents its backflow. 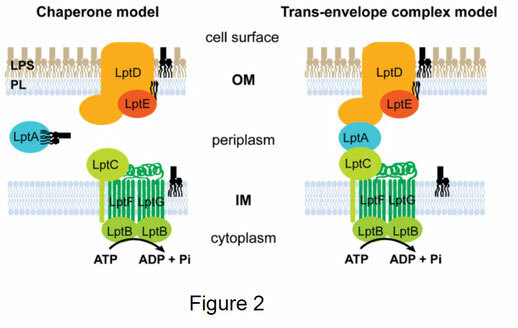 A generalized model for the transport of LPS across the cell envelope to the cell surface is shown in the top panel of figure 6 (adapted from 2) and proposes that LPS is transported by a similar mechanism as a “PEZ candy dispenser”. This contains a spring-loaded platform at its base which pushes PEZ candies up through a central channel of the dispenser, ensuring that candy is always present at the exit of the dispenser. Therefore, LPS is also transported as a stream of molecules by the Lpt system which is powered by ATP hydrolysis catalyzed by the LptB2GFC transporter at the base of the protein bridge, comprising LptCAD. Analogously, LptB2GFC functions as the spring-loaded platform of the PEZ dispenser by pushing new LPS molecules into the channel at the base of the stream of LPS molecules. This model also predicts that the LptCAD bridge is a passive conduit for the transport of LPS across the aqueous periplasm, while the LptDE translocon in the OM, that facilitates insertion and assembly of LPS into the outer leaflet of the OM, serves as the exit of the PEZ dispenser, opening to deliver its cargo (2). The structural data discussed above allow a refinement of the initial steps (figure 6 bottom panel) performed by LptB2GFC transporter. First, newly synthesized LPS that is present in the IM binds at the entry point of the complex located at the TMD of LptC between TMD1 of LptG and TMD5 of LptF. Subsequent ATP-dependent narrowing of this cavity generates the required force to extract LPS from the IM. This process – ATP hydrolysis and LPS extraction – is coordinated by the TMD of LptC. 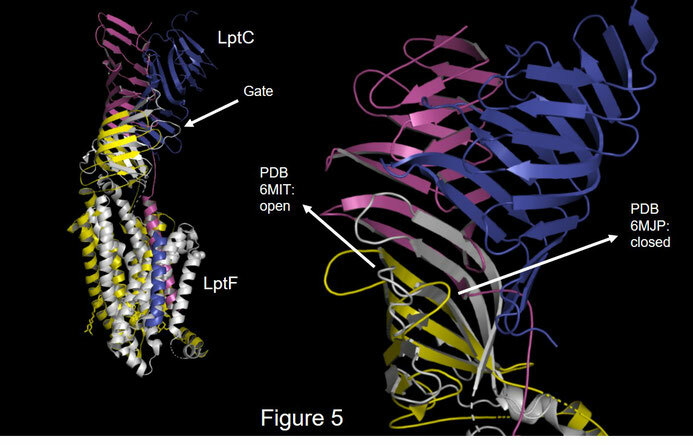 Next, LPS pushes the gate of LptF open and moves onto the protein bridge, while closure of the gate prevents backflow of LPS and ensures a unidirectional movement towards the OM (6). The cell surface of Gram-negative bacteria is decorated with a thick layer of LPS-based glycolipids, which protects the cell against a variety of obnoxious compounds such as antibiotics and bile salts. LPS is a complex glycolipid with numerous sugar moieties that is a crucial structural component of the OM and it is therefore not surprising that it is essential in most Gram-negatives. The immunogenic properties of LPS have been studied since the early 1900s, while the groundbreaking studies by the group of Marie Jane Osborn in 1972 established that LPS biosynthesis occurs at the IM. 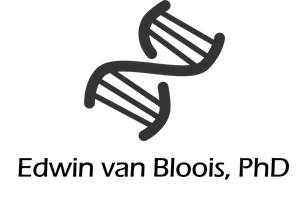 Moreover, the genetics of LPS biosynthesis were elucidated by the labs of Christian Raetz, Chris Whitfield and others in the 1980s and 1990s. The finding that LPS biosynthesis occurs at IM implies that LPS is transported to the outer leaflet of the OM. Although several models have been proposed to explain the transport of LPS (figure 2), accumulating biochemical and structural evidence strongly suggest that this facilitated by a group of seven proteins. These are known as Lpt (LPS transport)ABCDEFG and are essential for cell viability in most Gram-negatives. Based on the current view, Lpt proteins form a transenvelope bridge with a transport complex in the IM made up of LptB2GFC that probably extracts LPS from the IM which is driven by ATP hydrolysis. A protein bridge comprising LptCAD spans the periplasm and serves a conduit for LPS from the IM to the OM. At the OM, the LptDE translocon receives LPS from the bridge and ensures it insertion and assembly into the outer leaflet of the OM. The Lpt system is thought to be mechanistically similar to a PEZ candy dispenser (figure 6). Identification of new drug targets is of key importance considering the growing amount of antibiotic-resistant Gram-negative pathogens. A detailed molecular understanding of how the Lpt proteins facilitate LPS transport is therefore crucial to design drugs that interfere with this pathway. In fact, Murepavadin is a β-hairpin peptidomimetic antibiotic directed against Pseudomonas aeruginosa LptD (16) that is currently evaluated in phase 3 clinical trials. 1. Silhavy TJ, Kahne D, Walker S. 2010. The bacterial cell envelope. Cold Spring Harb Perspect Biol. 5: a000414. 2. Bertani B, Ruiz N. 2018. Function and Biogenesis of Lipopolysaccharides. EcoSal Plus. doi: 10.1128/ecosalplus.ESP-0001-2018. 3. Simpson BW, May JM, Sherman DJ, Kahne D, Ruiz N. 2015. Lipopolysaccharide transport to the cell surface: biosynthesis and extraction from the inner membrane. Philos Trans R Soc Lond B Biol Sci. 370: 20150029. 4. May JM, Sherman DJ, Simpson BW, Ruiz N, Kahne D. 2015. 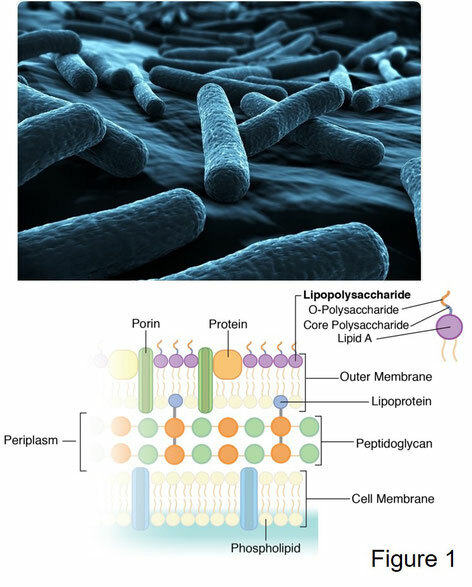 Lipopolysaccharide transport to the cell surface: periplasmic transport and assembly into the outer membrane. Philos Trans R Soc Lond B Biol Sci. 370: 20150027. 5. Botos I, Majdalani N, Mayclin SJ, McCarthy JG, Lundquist K, Wojtowicz D, Barnard TJ, Gumbart JC, Buchanan SK. 2016. Structural and Functional Characterization of the LPS Transporter LptDE from Gram-Negative Pathogens. Structure. 24: 965-976. 6. Owens TW, Taylor RJ, Pahil KS, Bertani BR, Ruiz N, Kruse AC, Kahne D. 2019. Structural basis of unidirectional export of lipopolysaccharide to the cell surface. Nature. 567: 550-553. 7. Bayer ME. 1968. Areas of adhesion between wall and membrane of Escherichia coli. J Gen Microbiol. 53: 395-404. 8. Mühlradt PF, Menzel J, Golecki JR, Speth V. 1973. Outer membrane of salmonella. Sites of export of newly synthesised lipopolysaccharide on the bacterial surface. Eur J Biochem. 35: 471-81. 9. Bos MP, Robert V, Tommassen J. 2007. Biogenesis of the gram-negative bacterial outer membrane. Annu Rev Microbiol. 61: 191-214. 11. Chng SS, Gronenberg LS, Kahne D. 2010. Proteins required for lipopolysaccharide assembly in Escherichia coli form a transenvelope complex. Biochemistry. 49: 4565-4567. 12. Suits MD, Sperandeo P, Dehò G, Polissi A, Jia Z. 2008. Novel structure of the conserved gram-negative lipopolysaccharide transport protein A and mutagenesis analysis. J Mol Biol. 380: 476-488. 13. Tran AX, Dong C, Whitfield C. 2010. Structure and functional analysis of LptC, a conserved membrane protein involved in the lipopolysaccharide export pathway in Escherichia coli. J Biol Chem. 285: 33529-33539. 14. Freinkman E, Okuda S, Ruiz N, Kahne D. 2012. Regulated assembly of the transenvelope protein complex required for lipopolysaccharide export. Biochemistry. 51: 4800-4806. 15. Sherman DJ, Xie R, Taylor RJ, George AH, Okuda S, Foster PJ, Needleman DJ, Kahne D. 2018. Lipopolysaccharide is transported to the cell surface by a membrane-to-membrane protein bridge. Science. 359: 798-801. 16. Schmidt J, Patora-Komisarska K, Moehle K, Obrecht D, Robinson JA. 2013. Structural studies of β-hairpin peptidomimetic antibiotics that target LptD in Pseudomonas sp. Bioorg Med Chem. 21: 5806-5810.